The best self-study language method? There are a lot of self-study language methods out there, and for the person looking to learn a language on their own, it can be hard and confusing to choose the method that suits your needs. There are plenty of great methods available to students wishing to learn a language on their own, and in this post I’ll try to tackle a few that, in my opinion, as well as in the opinion of some of the most well-known polyglots out there, are some of the best and easiest to go through. So if you were to ask “What’s the ‘best’ method out there?”, what could a seasoned language learner answer? Well, the truth is, there is no objective or universal answer to this question. Since we all learn in different ways, some methods might be more suitable to some people than others. Plus, different languages might need to be learned in different ways, again, depending on your learning style and on your ability to acquire and understand new grammatical structures and language systems. For example, I have learned Spanish very differently from Korean. Spanish is a Romance language very similar to French and English, languages I speak fluently. Korean, on the other hand, is at the complete opposite end of the spectrum. While Spanish can often be learned in a more “inductive” manner, this does not always work with Korean. So you’ll have to keep this in mind when trying out a new or old method and when relying on your learning habits that might have worked in one instance, but might not work the best in another. Type of method: dialogues with minor grammatical explanations in footnotes. Audio, entirely in the target language, is included. The first self-study language I will introduce is one of my favorites, and it’s the favorite method of several well-known polyglots, including Luca Lampariello, who speaks nearly 12 languages fluently, and Robert Bigler, a simultaneous interpreter from Austria who speaks many languages as well. The method is called Assimil, and although it is not that well-known in North America, it is an extremely popular method in Europe. So what is it, how do you use it, and why do I recommend it? Each method consists of a coursebook with 100 lessons on average (~4-6 pages/lesson). 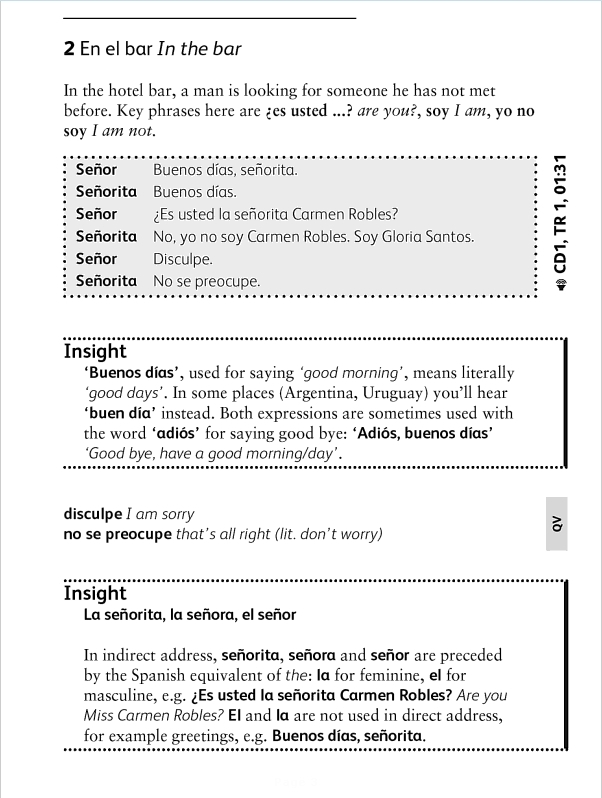 Each lesson includes a short dialogue (getting progressively longer throughout the book), written in the target language (L2), together with a translation after each dialogue, as well as short exercises to test your comprehension. You are recommended to spend at least one day on each lesson and to review them every once in a while. As you follow through the dialogues, you listen to the audio and read through. The great thing about the audio is that it does not contain lengthy explanations in English. I believe this is good and important, because there is nothing as annoying (and useless), in my opinion, as audio CDs that are half in your native tongue, with things such as “repeat the following sentence” or “pay attention to this particular ending”, etc. Assimil, you might have guessed from the name, encourages learners to “assimilate” the language, similarly to how you assimilated your mother tongue when you were a child. It’s very intuitive, but at the same time there are helpful explanations grammatical rules and language expressions in the footnotes. Below, you’ll see a preview of what the Assimil method looks like. I’ve picked a random page from their French method. 1) The dialogues do not have names of people, they are only numbered. It can sometimes be confusing to follow the conversations as, often, 3 to 4 people are having a conversation, so at times you’re not sure who’s saying what. It really is not a big deal, honestly, but I thought I’d mention it anyway. 2) In the Chinese method, for some reason the author thought it would be a good idea to put an exclamation mark (or an interrogation mark) to almost every single sentence in the book (no joke, it’s quite amazing). Not a big deal but you’re sometimes wondering why the speakers seem that excited. I haven’t seen this in other Assimil books I’ve looked at, though. Luca Lampariello has said that he was rather disappointed with the Chinese method of the Assimil series, but I’ve found it to be thorough and worth going through nevertheless. 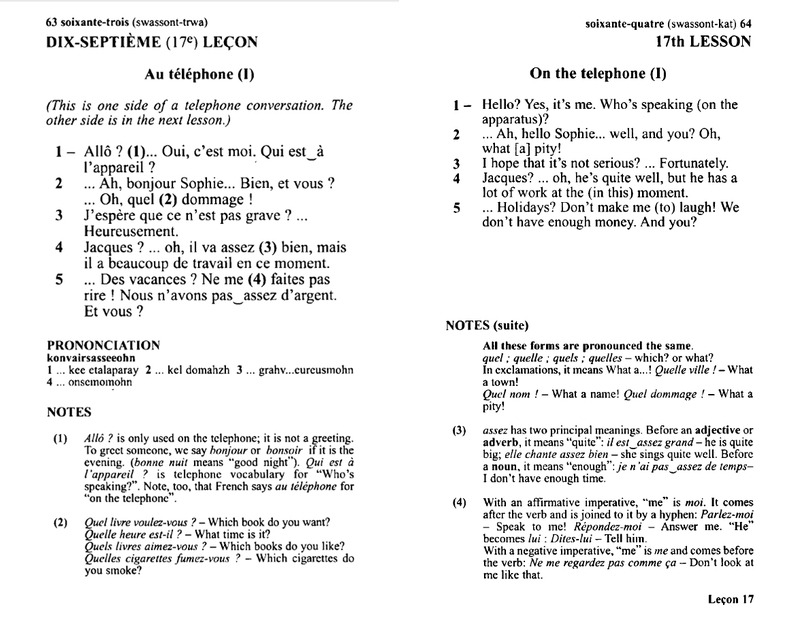 Type of method: Each unit in Teach Yourself usually contains a dialogue with direct translations next or below the sentences, as well as exercises, translations, grammar points, etc., together with audio CDs. The Teach Yourself Languages range is available in print, audio and CD packs, e-books, enhanced e-books (which utilize multimedia to enhance the learning experience), and will soon be launched as a series of apps for smart devices. Each new Teach Yourself product is graded according to a unique 5 level guide. According to the Teach Yourself website, all of their language courses are suitable for beginners – they just get you to different levels of proficiency, at different paces of study. However, I have tried their Chinese method (Teach Yourself Chinese Complete Course, by Elizabeth Scurfield), and I’ve found it to be way too hard for a complete beginner in the language. Each unit introduces a whole new list of words and the pace is definitely too fast. In my opinion, this particular book is definitely suitable for a high-beginner (A2) or low-intermediate learner (B1). In general, the Teach Yourself language series books are quite good, but many polyglots, as well as myself, prefer Assimil. Nonetheless, Moses McCormick, a polyglot who has studied over 50 languages, is well-known for using this method and he wholeheartedly recommends it. So how exactly does the method work? The good thing about Teach Yourself is that their method is available in many more languages than most other methods out there. It’s also rather easy to go through even for inexperienced language learners. The biggest downside is that depending on the levels you choose, the pace of some books might go too fast for a beginner (such as the Teach Yourself Chinese Complete Course). In the latter case, you should wait until you have a reached a high-beginner (A2) or low-intermediate (B1) level before actually tackling it. In this specific Chinese method, another big problem is that they don’t introduce any characters until halfway through the book. So you don’t even have the option of getting somewhat familiarized with characters at first. However, fortunately in the other Teach Yourself series I have seen, the scripts are indeed included from the very beginning, so this particular Chinese method seems to be just one bad apple. In brief, Teach Yourself is a solid language learning series, although you should make sure the pace of their books suits your needs. The great thing about this method is that it’s available in over 65 languages, which is quite amazing, and the books can be easily bought pretty much anywhere. However, explanations tend to be lengthier than Assimil, and as such the Teach Yourself series definitely contains more English than Assimil. That’s it for part 1 of my review of some of the most popular self-study language methods out there. 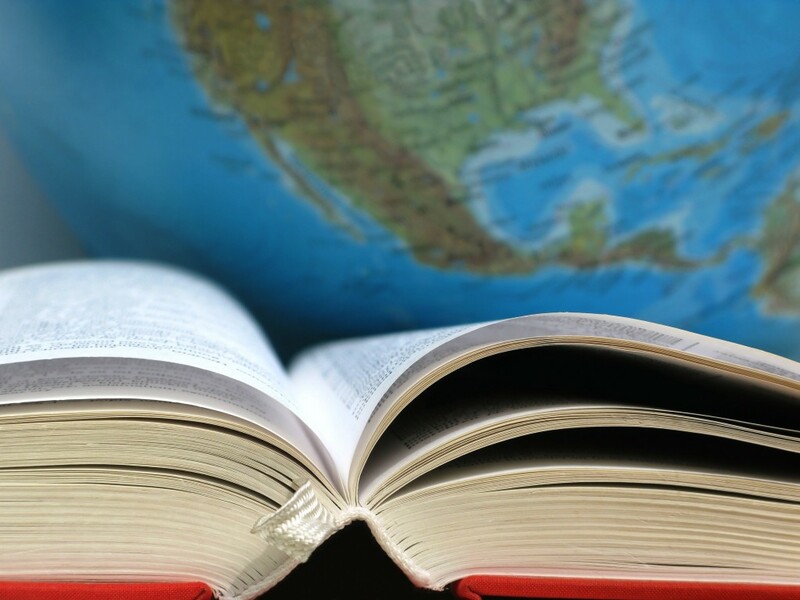 In part 2, we’ll have a look at three other popular methods: Pimsleur, Living Language, and Michel Thomas. Hey Sam, thanks for sharing your thoughts on these methods. After doing a little research while choosing a self-study method for Mandarin, I settled on Pimsleur (in combination with some Anki flashcards). I’ll be looking forward to reading your insight about that program. I completed about 40 of the 90 lessons in Pimsleur, but stopped there and haven’t picked it up since. On one hand, it helped me assimilate a few grammar structures, yet I also found that most of the vocabulary wasn’t of much use to me. Anyhow, the two programs you’ve reviewed here look interesting. I may take a look at Assimil. Do you remember if the instruction book is written in hanzi or pinyin? Hey Henry! I’ve personally gone through all 3 CDs (90 lessons) of the Pimsleur Mandarin series. I think Pimsleur is great, but it lacks something since it’s only an audio method. I would definitely complement Pimsleur with another method, such as Assimil. The Assimil Chinese method is written both in hanzi and pinyin. They also have a separate book just for the Chinese characters that come up in the main book, so if you go through that book as well you’ll be able to read and write Chinese characters decently by the end of the book. As for Anki, I think it’s an amazing program. You can also download pre-made flashcard decks online (ankiweb.net), and some of them have audio and pictures included. It’s worth taking a look! Cool, thanks for sharing your experience with Pimsleur Chinese. Recently I’ve been studying an hour or two a day with the “Mastering Chinese Charcters” decks from Ankiweb, which are great — I’m amazed that they have full audio for all of the sentences! That’s been going quite well, but it’d be nice to supplement them with something that focuses more on grammar and basic everyday vocab. Your suggestions look like they will fill that gap. This makes me want to try Assimil. I’ve had success with Pimsleur, but after finishing all 3 levels, I still feel like I have a loooooong way to go. I believe that 3 levels of Pimsleur teach about 500 to 750 vocab words, so Assimil seems like a logical progression, considering its 2000 to 3000 vocab words. (I’m speaking generally of course, since of course vocabulary words aren’t the only part of language learning.) Great review! Yes I feel like Pimsleur is good for a start, but definitely does not go far enough to enable somebody to reach some kind of low-intermediate level. Assimil would be indeed a logical progression, and since you will have already been exposed to the language, you’ll be able to somewhat breeze through the first few lessons. I think there’s a big downside towards doing reviews/pros & cons. It’s a constant search for the “best” and “all inclusive” resource. This will really spread you thin across tons of places. Granted, there are some crappy language learning products out there… but getting things right is probably the last thing a beginner should worry about. Whether they get a textbook, a tutor, or pimsleur – i think their their job is to get into the habit of learning/knocking out that resource & pulling away as much as they can. Then, they can focus on adjusting what they want and need. I agree so much with you . Beginners should gain momentum first. Learning what it is to be learning a language on your own. Then when in the intermediate stage they can adjust. I also recommend that — once they´ve settled on their language-learning ¨methods¨ and materials — they don’t visit anymore language learning websites (even though I have one) until they reach that stage. Too many distractions out there about “the latest and most effective methods” that can put your language learning to an absolute stand-still. Well I must say I disagree. The reason learning languages gets easier over time is partly because you get to know yourself better as a learner. I think it’s definitely important to choose a method at the very beginning that is suitable to your learning style and that motivates you. The percentage of people who undertake the study of a foreign language and actually go all the way to reach an advanced level is very low. I’ve also been reading blogs about language learning for the past 3+ years and I’ve found it to be a fantastic way to connect with the language learning community and to get useful tips for my own study. I would say it has definitely helped me. Lastly, as stated at the very beginning of this article, I emphasize the fact that there is no “best” language learning method. They are just different and might be suitable to different types of people. Plus, a language learning method will never be “all inclusive.” Any serious language learner should consider using at least 3 different methods for the same language. Professor Alexander Arguelles has argued that on average, at least 5 are necessary to reach an advanced level in any given language. Obviously reviews help to make the choice easier for people out of the sea of information, books, and methods available out there. Thanks for reading and I’m always happy to hear your views! It’s good to spend a certain amount of time on selecting your methods and materials. There’s no argument about that. And reviews like yours are very helpful for that. However, to beginners I recommend that once they’ve selected them, they stick with them until they reach something of an intermediate level or complete the materials, whichever comes first. They need to learn about studying on their own. Not so much technically, but mentally. They need to experience, for example, that progress is not linear. Some weeks you may feel you´re making immense progress and in others it may seem that you’re actually going backwards. But it’s often in those ¨bad weeks¨ that you’re actually learning more. And I think that failing to learn from these kind of experiences, is what causes people to fail to reach an advanced level, more than anything else. I agree that reading language-learning blogs can be motivating, but still in the beginners phase the potential distractions are great. Before you know it you are spending more time learning about learning languages than actually learning your new language. If you’re a beginner (no self-study experience whatsoever) it may be wiser to not visit them at all for a while. Hi Sam. Can you tell me where can I get assimil for $30-35? I’ve been trying to get one but the cheapest I could find is $60 for both book and CDs. I’m sorry, I had made a mistake and $30 was the price for the book only. Indeed, the price for the book and the CDs included will be around $60 or $70. You might be able to get a used one for cheaper. I’ve made the changes to reflect the actual price. Thanks! Hi, an information: are there many differences between the latest edition of Assimil and the older ones? Which one is the best? Hi Gianluca. Sorry for the late response, I didn’t notice this message until now! I therefore personally think it’s better to buy some newer editions, although buying the latest one is not necessary. Generally speaking, as long as the book you’re purchasing is not older than 10-15 years, you should be OK (unless, of course, you wish to learn slang words and that type of stuff). Hi there! I recently have become obsessed with learning languages since I started using Duolingo for fun 2 months ago. I only speak English and I am currently learning Spanish with Assimil. I’ve watched a bunch of interviews with you and Luca and I have to say they are very informative and motivating for a first time language learner! A question I had, maybe a long one but, I currently study a single Assimil lesson a day for about 45 mins to an hour, on top of using duolingo for vocab and grammar 10 mins or so a day. I also try and translate some of my thoughts in my head to my L2 like you have suggested in some of your videos 🙂 I was just wondering if there was any other small things I could possibly do in my early stages (1-4 months) each day to maximize my language learning, anything that you perhaps do when first starting out with a language besides what I already do. Any extra information would be much appreciated! Thanks for your kind message, I always really appreciate when readers take some of their time to drop a thank you note and share their experience with me. Right now, you seem to be doing pretty well, and the only thing I would say is don’t burn yourself out and, perhaps more importantly, be prepared for when motivation will go through a low. It’s inevitable, but if you’re prepared you’ll be able to deal more easily with it. Develop strong, consistent habits and make sure you don’t stray away from them. When feeling down and demotivated, try a bit of variety and take a brake away from textbooks and explore music and movies in Spanish instead. Other than that, I would say don’t forget to enjoy yourself and dive into the culture. If this interests you, learn about Spain and South America’s history and culture, try to discover some of their music, and download some movies with English subtitles. As you become more advanced, slowly get yourself immersed in the language. Think about changing your Facebook and other programs’ language to Spanish, read the news in Spanish, listen to Spanish radio, etc. In other words, make the language part of your life. Above all, good luck and keep me posted as you progress on your journey! I didn’t expect to get such a detailed reply, it really shows your passion for language learning and helping out the newbies.Thanks for all the advice, I will definitely keep you posted on my language journey. Keep up the great work on this site! It’s been 7 months!! how are you doing now?? Nice to see your still active! I have been with my significant other whose 1st language was spanish for quite some time but she is an awful teacher (self-admitted) and have found much help/motivation from your comments, blogs, and posts… We aren’t fluent yet but i am doing well enough she says and i get to practice plenty! it also helps i can just tell her to not talk to me in anything but spanish sometimes hahah. Let me know if you ever need any advice on Spanish. I need to get back to learning it actually, I’ve been focused a lot on other languages for the past 1-2 years but I really don’t want to lose it! That’s pretty cool, thanks for sharing! I might look into some additional self-study methods in the future, and review them if I have time. You wrote that Teach Yourself offers language courses for 65+ languages. I can “only” find ~50. Could you provide a list with all the languages from this seller? I would add a link to the part2 if I were you :). Did u ever find part 2??? hi, what do you think about pimsleur? i’m planning to buy french phase 1. i have tried the free 30 minute lesson and i think i like it. I feel like these are good suggestions for beginners, but what is the best way to get better once you’ve made it around intermediate/advanced on your own? Maybe it depends more on the person? I know you should listen/read native material etc, and that’s what I do in Japanese, but I feel like improvement is extreeemeellyyy sloooowww. And not that the test is the best gauge, but I’ve passed N2 JLPT, so I feel like I should be able to understand more. But then I crack open a manga intended for pre-adolescent boys and my understanding of some parts is nearly nil. Whhhyyyyyyyyy. And I disagree with the notion that you shouldn’t ever use manga or anime, it shouldn’t be your primary source probably, but if a child can understand it, and I want to eventually be fluent, I don’t see why it can’t be a supplement. I didn’t speak any English and consider 4 months with the Assimil method and now I am intermediate level. “The dialogues do not have names of people, they are only numbered. It can sometimes be confusing” – I think it’s quite the opposite. The absence of names makes it a lot easier to focus on the actual speech of the speakers, and not on their names. which are not only irrelevant, but also often times difficult to comprehend in a new language. I have become obsessed about learning French. I just started with Assimil. I also listen to music, news, cooking channels…. I don’t understand everything, I just understand a little, but I am okay with that. Please I need your help. Can you tell me how you do Assimil? Did you start translating to your language the dialogue and back to the target language in lesson 1 or you did it in phase 2? You went back to lesson 1 and translated to your language, then to the target language, and on that day also you did lesson 50 listening, reading, pronouncing it several times until you got it? I know you have interviewed Luca Lampariello. How does Luca do Assimil? does he start in lesson 1 translating the dialogue or in phase 2. two lessons a day back to first lesson writing it to your language and back to the target, and on the same day lesson 50. I am confused 🙁 Please clarify to me. Mos importantly, I want you to amplify how you do Assimil step by step. I will really appreciate your reply. I admire you, because it takes a lot of dedication to learn another language, and you speak several languages.